« 96—What were you doing when..? What is the biggest time change when crossing a Chinese border? This came up in a pub quiz evening in Qingdao. The answer is 3½ hours. China has one time zone. The US has seven (a Trivial Pursuit answer to dispute; as ever the question must be phrased oh-so-carefully so the answer is correct—the mainland US has six time zones, the States have seven and with the dependent territories, take a stab at eleven or even twelve. In the winter, standard times are: Atlantic -4; Eastern -5; Central -6; Mountain -7; Pacific -8; Alaskan -9; Hawai’ian -10. That’s seven, there are nine official ones plus Wake Island; add Samoa [-11] and Chamorro [+10]. Labels are AST, EST, CST, MST, PST and, I guess, AKST and HST, so noon in London is 20:00 in China, 08:00 in New York, 05:00 in Colorado and 02:00 in Honolulu. I missed changing from GMT to UTC¹; I continue to refer orally to GMT and Zulu time, but have tried to use UTC here. 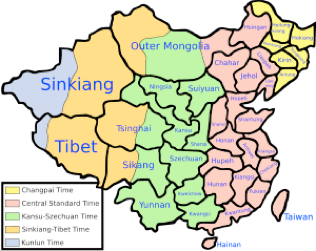 Second Trivial Pursuit answer: China spans five time zones, diagram shows (wikipedia again) system 1912-1949. Summer time ran 1935-1962, but “in parts of China”. Xinjiang locally runs at Urumqi time, UTC+6, but this is not official, just common practice. 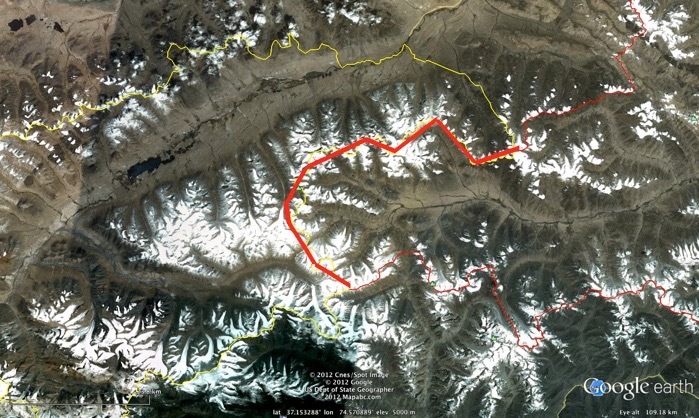 Crossing to India/Nepal is UTC+05:30, but there is a small border with Afghanistan called the Wakhan corridor, UTC+04:30 so 3½ hours different—that’s “jet lag by foot”, perhaps. See. The place is at the top of the Wakhjir Pass, close to 5000m up. This place lends new meaning to ‘remote’. The pass is one of the Silk Roads—I thought there was only one—and lies at the junction of the Hindu Kush with the Karakoram and the Pamir mountains. The border is basically closed. ..and a half-hour? There are time zones with ½ hour difference. some 16 countries do this.... covered further down the page. There is a need for steady development of Afghanistan, rich in mineral supplies and current news (mid-September 2012) says there’s both a lot of jockeying for position and a lot of things going wrong. You might look up chromite mining and its current sale through anything-but-proper channels (is that smuggling?). I found pages dated as old as two years ago—and some from this week. I marked the border on this lower version and can see that it would be far more tempting to cross to Tadjikistan to the north and then cut south-east, up the valley of the (pause to look it up—not found, but I suppose it should be the Wakhjir). Playing with Google Earth says that the crossing point one would walk would be to take the EW valley and then the (brown) valley facing NE/SW, not the ENE one a little further south. A serious hiking challenge; plus a long-lasting political one, as there is no border point—one would meet Chinese border guards, well-known for their sense of humour. Or its lack. I also point out that there are several visible possible routes across the thick red line I have drawn, where the various websites I found says there is only one. • 50% of children from 12–23 months, and 25% of children from 24–35 months were malnourished. Household smoke pollution is a big problem. It is clear from research all over the world that smoke pollution in the house significantly increases death from lung disease in both adults and children. In consultation with the community, the survey team designed a flued stove, which is currently undergoing trials in 15 households. In the year to April 2006, child mortality had fallen to 20%, a reduction of around 40%. Earthquakes occur here. The border is impassible for 6 months of the year. Very few have crossed it, ever. Like fewer than a dozen people in the 20th century, perhaps only half that. More at footnote ².
Nepal [+05:45] is 15 minutes different from Bangladesh. Canada uses a half-hour offset [-03:30], for the provinces of Newfoundland and southern Labrador. Australia uses one [+9:30] for its Central zone, North and South. The latter does summer time; tropical places don’t. To that we might add a very strange little area in Australia about the size of Belgium with 200 people, CWST [+08:45]. Wikipedia lists ‘Additional information’, of which I repeat and extend some of that next, but there is conflict between those lists found for <nation> territory time zones and this site. Russia has reduced to nine since 2010; Kaliningrad [+3] to Magadan [+12] less [+5]. Russian railways run on Moscow time. Australia nine (9, 10, 11, or 12) (three official (WST, ACST, AEST; five in DST), one unofficial [CWST, +08:45], several (three or five, overseas territories (Heard & McDonald Island [+5], Cocos Islands [+6:30], Christmas island [+7], Lord Howe Island [+10:30], Norfolk Island [+11:30] plus three Antarctic slices, +6,+7,+8]. This list disagrees with the Wiki Additional info referred to but records from “Time in Australia’ —a confusion I cannot yet sort out. The UK (with its dependencies) has eight; Pitcairn [-8], Caymans, Turks& Caicos [-5], Anguilla, Bermuda, the Virgins, Falklands, Montserrat [-4], South Georgia, South Sandwich [-2], UK, St Helena, Ascension, etc [GMT], Gibraltar [+1], Akrotiri etc (Cyprus) [+2], Brit Indian Ocean Terr [+6]. Any Antarctic territory is in line with Falkland & S Georgia. The Danish realm has five, four in Greenland [-4,-3,-1,0] plus Denmark itself [+1]. New Zealand has five: Niue [-11], Cook Is [-10]. NZ [+12], Chatham Is [+12:45] and Tokelau[+13]. Doing editing and revisiting of pages in 201711, I notice that there is now a comprehensive wikipedia page on this titled topic. Surely this is serendipity, not someone actually reading my stuff? I am sure I read that the number of westerners who have crossed this border is a remarkably low number, perhaps below ten for the whole of the twentieth century. I cannot find that statement a second time to reference it. https://www.cia.gov/library/readingroom/docs/CIA-RDP81B00401R000600120001-5.pdf alternate reading. Really interesting source. Added in 2017, from here, a much better map of this bit of Afghanistan. Do not confuse getting into the region with the quite separate issue of crossing into China. The alternate reading above explains that the whole point of this thumb of land was to make sure that Britain and Russia had no common border, relevant in 1895 and defined over a period from 1869 to 1963. In a sense, once these two parties were separated, there was no good reason to clarify where the boundary lay. Any reports that say there is regular movement across this border should be doubted; the crossing can be done, but the ground and the weather work against any sense of regularity. Fort this reason the route is useless for large movements (think military), requiring a modern equivalent of Hannibal crossing the Alps. Make a damn good story, though. Mind, guessing from the numbers of locals with red hair and blue eyes (and with Dari being the subcontinental version of Persian) Darius and Alexander might well have been close by at some point. 1 UTC (coordinated universal time, from 1972) = GMT (Greenwich mean time, from 1904) = Zulu time, universal time, world time. UK is at zero, China is +8, Central Standard time is -6. Afghanistan is at UTC+4:30. 2 [Wikipedia]: The Wakhjir Pass (simplified Chinese: 瓦赫吉尔山口; traditional Chinese: 瓦赫吉爾山口; pinyin: Wǎhèjí'ěr Shānkǒu; Wade–Giles: Wa3-ho4-chi2-erh3 Shan1-K'ou3; Persian: کوتل وجیر‎ Kōtal-e Vakhjīr) is a mountain pass in the Hindu Kush or Pamirs at the eastern end of the Wakhan Corridor, the only pass between Afghanistan and China. 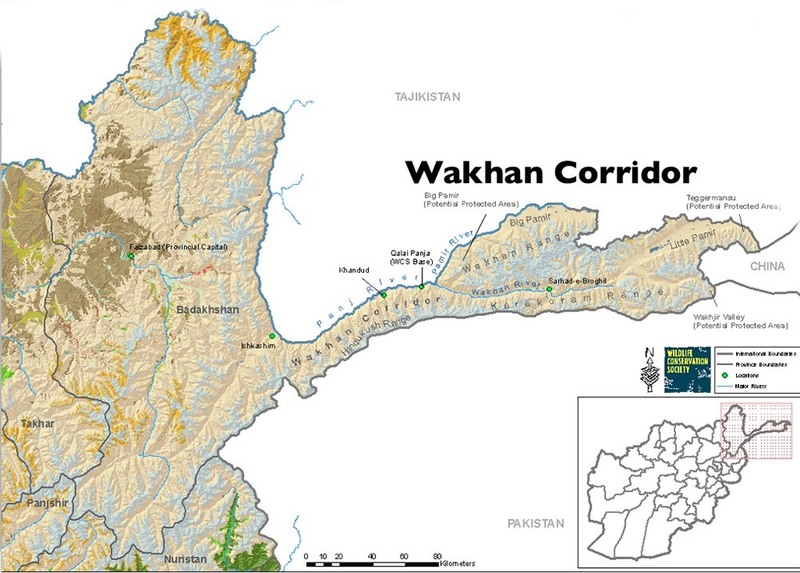 It links Wakhan in Afghanistan with the Tashkurgan Tajik Autonomous County in Xinjiang, China, at an altitude of 4,923 m, but the pass is not an official border crossing point. The border has the sharpest official change of clocks of any international frontier (UTC+4:30 in Afghanistan to UTC+8, China Standard Time, in China). There is no road across the pass. On the Afghan side the nearest road is a rough road to Sarhad-e Wakhan (also known as Sarhad-e Broghil), about 100 km from the pass by paths. On the Chinese side there is a jeep track about 15 km from the pass, which leads through the Taghdumbash Pamir to the Karakoram Highway 80 km away. In the summer of 2009 the Chinese Ministry of Defence began construction of a new road to within 10 km of the border, for use by border guards. The pass is closed for at least five months a year and is open irregularly for the remainder. Just below the pass on the Afghan side is an ice cave, at an altitude of 4,554 m. This is the source of the Wakhjir River, which ultimately flows to the Amu Darya (or Oxus). The cave is therefore claimed as a source of the Amu Darya. The terrain is extremely difficult, although Aurel Stein reported that the immediate approaches to the pass were "remarkably easy". There are few records of successful crossings by foreigners. 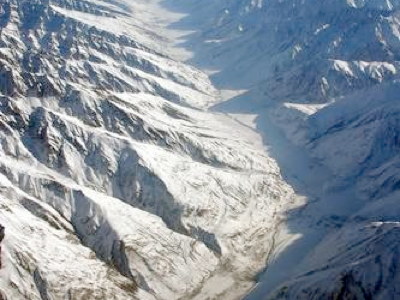 Historically the pass was a trading route between Badakhshan and Yarkand used by merchants from Bajaor. It appears that Marco Polo came this way, although he did not mention the pass by name. The Jesuit priest Benedict Goëz crossed from the Wakhan to China between 1602 and 1606. The next accounts are from the period of the Great Game in the late 19th century. In 1868, a pundit or Indian surveyor known as the Mirza, working for the Great Trigonometric Survey of India, crossed the pass. There were further crossings in 1874 by Captain T E Gordon of the British Army, in 1891 by Francis Younghusband, and in 1894 by Lord Curzon. In May 1906 Sir Aurel Stein crossed, and reported that at that time the pass was used by only 100 pony loads of goods each way annually. Since then the only westerner to have crossed the pass seems to have been H W Tilman in 1947. In 1895 the pass was established as the border between China and Afghanistan in an agreement between the British and the Russians, although the Chinese and Afghans did not finally agree on the border until 1963.